Living Hope Church Bible Study: God Shows No Partiality. Neither Should We. God Shows No Partiality. Neither Should We. have certain qualities, and since his people belong to him, they ought to begin displaying the same qualities. At a crucial point in the life of the early church, the typically heavy-footed Peter came face to face with this logic when he entered the home of Cornelius the Roman Centurion. Peter had been raised, along with all his Jewish brothers and sisters, to believe that Gentiles were beneath them and the Romans were oppressors who needed to go. But one afternoon he was praying on a rooftop on the shore of the Mediterranean when God began to change that. While he was staying in the home of a leather maker (an ironic twist in the story seeing that the job of leather making made one unclean), God put him in a trance and showed him a sheet full of unclean animals. When God told him to rise and eat, Peter responded out of his upbringing and faithfulness to Old Testament Law. “Never,” he said. “I have not eaten anything unclean and I won’t start now.” But God’s response is what changes things. God told him to never call anything unclean, or common, that he has called clean. At that moment an envoy from Cornelius shows up at the house where Peter is staying and asks him to come. God told Cornelius to send for Peter. God told Peter to go. God was up to something big. As soon as Peter enters the house of the Roman Centurion something strikes him as so important he repeats the topic twice in a short span of time. He says, “You yourselves know how unlawful it is for a Jew to associate with or to visit anyone of another nation, but God has shown me that I should not call any person common or unclean. So when I was sent for, I came without objection. I ask then why you sent for me” (Acts 10:28-29). And then, “Truly I understand that God shows no partiality” (Acts 10:34). Peter was raised to show a harsh partiality. He was raised with a strict “us vs. them” ethic and now God was teaching him something very different. 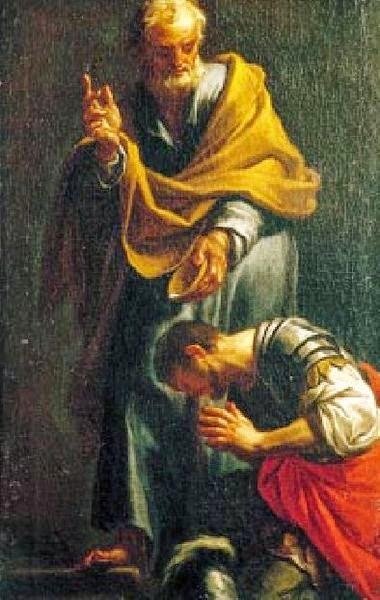 He was taught to see people like Cornelius as beneath the honor of his presence and on this day Peter brings a whole group of Jewish Christians into his house to fellowship, eat with him, and talk about Jesus. Peter came face to face that day with a truth woven into the bones of the Christian faith: no human being is unclean. Every human being is of inestimable value. Every human being is worthy of the Gospel of Jesus Christ. No human being is beneath a disciple of Jesus Christ. The logic is clear – no human being is beneath Jesus Christ, the God who emptied himself and became flesh. Thus, no human being is “less than” any other human being, and certainly not “less than” a follower of Jesus Christ. And every human life can become something that glorifies its Savior, Jesus Christ. And why is it no human is beneath another in the eyes of God? It is by virtue of our creation in the image of God, and, as God told Peter, God has called every human clean. In other words, our status measured in earthly or ethnic terms does not determine our worth. The creation and decision of God does. No human lacks the image of God. No human is unclean. One of the radical beliefs a Christian carries into this world is that God does not show partiality. For all of its bluster about equality and human rights, our culture loves to decide who is and who is not worthy of life and privilege. Our culture loves building ladders out of people. The abortion rate for children diagnosed with Down Syndrome is 94%. In a now infamous study, the abortion rate for African-American children in the city of Manhattan is over 80%. Children are still sold as slaves on the streets of Western, advanced cities. Political schemes rely on dividing people into groups that suspect and hate each other. Politicians have become wealthy beyond reason stoking those fires. And we all know the story goes on, and on. But the Christian belongs to another God, a different kind of God. One who does not show partiality. God does not draw distinctions between people, calling one better than another. And thus, by the grace and strength of God, neither do we.